Shorelands are naturally full of a rich diversity of life: plants, animals, and microorganisms, including humans. As we understand more about the structure and function of shoreland, we also become aware of the importance of our role in keeping these systems healthy. Our efforts can lead to the restoration of a quality outdoor resource, and a community full of life and beauty. 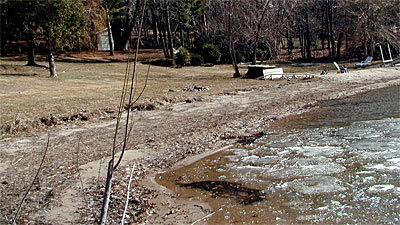 Shoreline erosion is evident on this lakeshore lot. 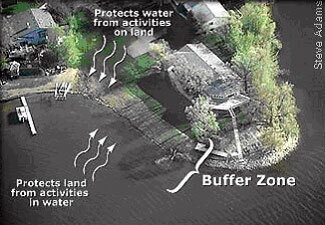 Creation of a buffer zone is the essence of the lakescaping concept. It is an opportunity to balance our needs and priorities with the needs and priorities of those with whom we share life at the edge of the water. 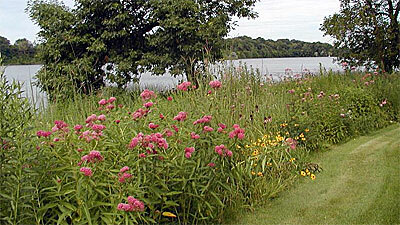 The restoration of a buffer zone using native plants. Restoring the balance of nature enhances the aesthetic quality and recreational opportunities we appreciate. It will also balance your lifestyle with the needs of the natural communities of plants and animals that also call the shoreland home.